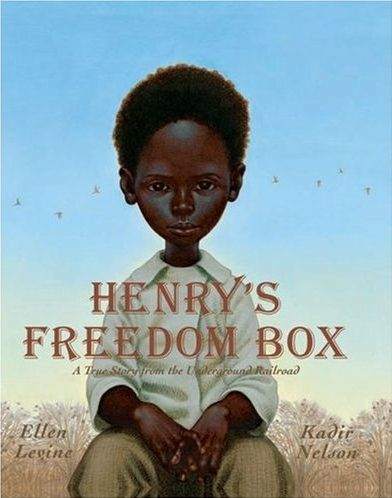 Reading “Henry’s Freedom Box” by Ellen Levine and Kadir Nelson to the class added to the curiosity and wonder about “Black History” for our students. 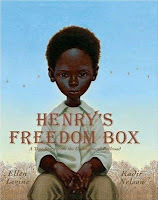 The discussion from the read-aloud helped to enhance and expand their understanding of this topic. They were anxious to get started with researching, learning and the sharing. For this unit six workstation activities were developed and the grade 5/6 students worked on three of the activities while working in groups of 4 or 5. Activity 1- Dramatic Presentation – Students selected a picture book to dramatize what they learned from the story. They had to write a short script and present it to the class. 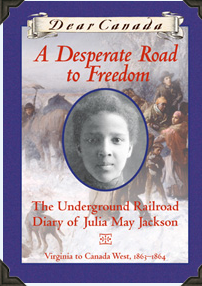 Activity 2 – Interactive Diary - Students read passages from “A Desperate Road to Freedom – The Underground Railroad Diary of Julia May Jackson” by Karleen Bradford. They then had to write from the perspective of a slave (mom, dad, child), plantation owner, abolitionist... Students used the iPod Touch to record their diary entry with the Dragon app. Activity 3 – Memorial – Students had to design a memorial for those who fought for freedom. They picked an individual or group that helped in the abolition of slavery. They had to plan and sketch a proposal to present to town council. Activity 4 – I Have a Dream – Students had to write their own short speech and video the speech using photo booth application. Activity 5 – Declaration of Rights – Students had to pick an area and brainstorm what they believe are the rights of a group or individual. They had to create a keynote presentation. Activity 6 – Timeline – Students had to research and create a timeline of important events and achievements of key individuals in Black history. They were provided with Internet links and had to create a timeline using Smart Ideas Software or Poster presentation. Students were completely engaged and excited about their learning. We gave students a 90-minute block to complete one workstation activity. We blocked 30 minutes for daily presentations. Every student was expected to share his or her learning to the class. The quality of the work produced was amazing. It was clear that the students understood the concepts and were able to share their knowledge with classmates. All students listened attentively while each group shared. The groups worked well together except for one team, they needed to review student responsibility. This leads me to point number six in the “Inquiry Approach versus Coverage Approach” chart that is posted on our website. The students in our inquiry-based classrooms have been learning how to become proficient collaborators and they are learning what social strategies look and sound like. It's important to set the stage for small groups and establish ground rules that allow students to be responsible for their learning. Daniels & Harvey (2009) discuss six factors to nurture in students: expectations, norms, friendship, leadership, communication and conflict. These factors help to develop strong interdependence group skills.